Please join us and invite your networks to tune in on Monday, March 25 at 12:00 PM PST for a Facebook Live with Senior Director of Medical Affairs at Genomic Health, Dr. Christy Russell and the Director of Research Programs at Susan G. Komen, Krissa Smith. Susan G. Komen has been concerned for years about the toxic side effects of chemotherapy. While it can be life-saving for some, it may also cause permanent heart and nerve damage, leaves patients vulnerable to infections, and increases the risk of leukemia later in life. This is why we have funded a body of research to find ways to more precisely treat breast cancers and potentially avoid chemotherapy. 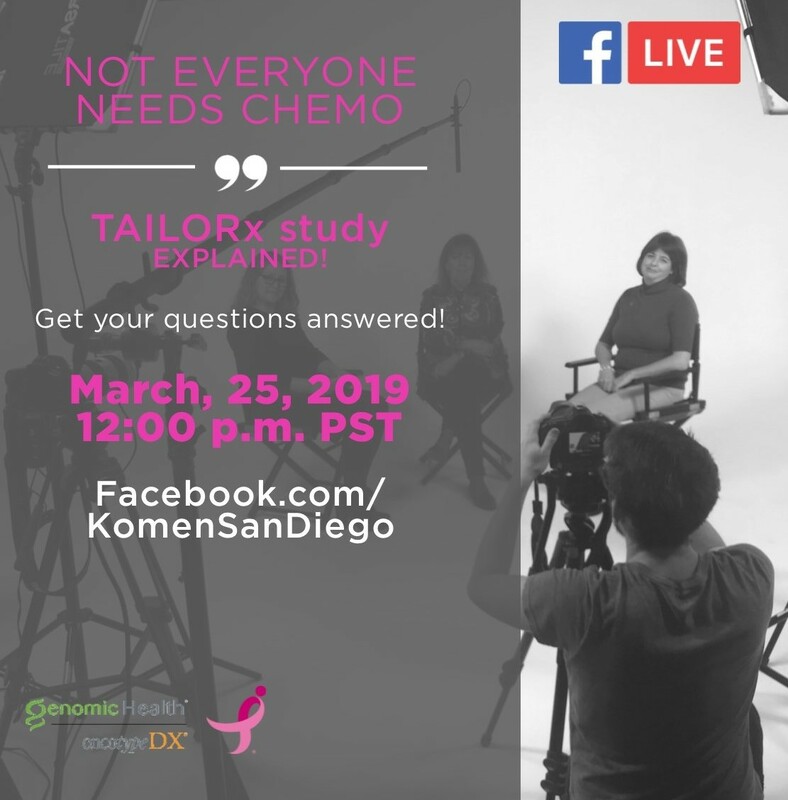 The TAILORx study, which was supported in part by Komen funding, suggests that through genomic testing we can find out more precisely if a patient would benefit from chemotherapy or not. The difference between Genetics and Genomics. The landmark TAILORx study and what it could mean for patients. You’ll meet Michelle Cruz, Breast Cancer Survivor whose life was changed by the TailorX study when she was diagnosed with breast cancer.